After irreconcilable differences with his previous musical project, Saturnus, Larsen began writing music of a different vein, similar in style to his neofolk influences but very different than the doom metal he had previously created. In 1999, the debut :Of The Wand & The Moon: album was released, entitled Nighttime Nightrhymes. Characterized by folk songs with themes ranging from expressions of love, loss, joy and ancestral Germanic paganism, the album was interspersed with experimental dark ambient pieces and tribal drumming. The album marked a new entry for Denmark in a new wave of Germanic post-industrial folk projects alongside contemporaries such as Forseti and Sonne Hagal. 2001 saw the release of a second :Of The Wand & The Moon: release entitled :Emptiness:Emptiness:Emptiness:, with refined production and a continued but expanded sound from previous work, the album further cemented the reputation of the project and featured an homage to Death In June's "Accidental protege" as the lyrically revised and melodically slowed "Here's to misery (a toast)." 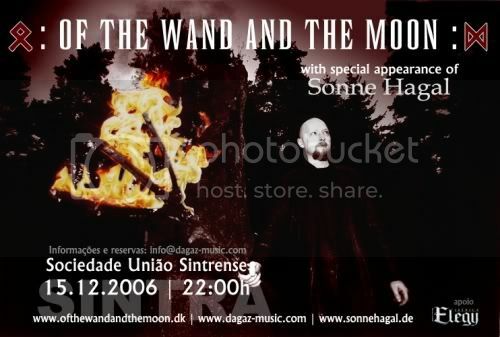 A live version of :Of The Wand & The Moon: also debuted in 2001, beginning a long series of shows over the next few years. After the release of a split album with Sol Invictus and a few vinyl singles, a collection of b-sides was released entitled Lucifer in 2003. Themed after its namesake yet featuring a photograph of a surprised cat on its cover, the record included various outtakes and unreleased tracks from the :Emptiness:Emptiness:Emptiness period. A box set was also released featuring vinyl versions of previous recordings, as well as exclusive material. A single entitled "Hail Hail Hail" was released in 2005 as a preview of upcoming material, showcasing a more experimental side of the project and making use of Arabic instrumentation for the title track. This was followed by a full length album entitled Sonnenheim which met to positive critical and fan reviews alike, marking the project as one of the major groups within its genre. The album further showcased themes of Germanic paganism, as exemplified by the title track "Nighttime in Sonnenheim" and introduced a more extroverted and thematically martial side of the project, with considerably less focus on the romantic love songs that had previously been hallmarks of the band's material. Sonne Hagal is a German experimental and neofolk group. They're going to do a concert today, that I hope I'll be able to attend, in Sintra, a village with a magical setting, with fairy-tale turrets, pre-Raphaelite gardens and leafy grottos, sometimes related with supernatural revelations and its fusion of pagan and divine. If you're able to, you should attend to this concert. You can hear some of : Of The Wand And The Moon : songs here and Sonne Hagal here.